The habitable zones of single stars are larger and wider as the temperatures increase. Although hotter stars have the widest regions where water can lie on the surface, they also have short lifetimes that limit the ability of life to evolve. Moons in close binary solar systems have a better chance of hosting life than those in single-star systems, new research has shown. Binary stars dampen each other's solar radiation and stellar winds, thereby creating a more hospitable environment for life and increasing the habitable zone around such solar systems, according to research presented at the 223rd American Astronomical Society meeting in January. Mason presented the results of a study, which used data collected by NASA's Kepler spacecraft mission to discover potentially habitable exoplanets in our region of the Milky Way galaxy. NASA's Kepler spacecraft has found over 5,000 potential planets, most of which will likely be confirmed. Scientists have combed through the list in search of the best planets to hunt for exomoons around. Although more than a thousand planets have been found outside of the solar system, as well as a host of candidates waiting for follow-up observations, no moons have yet been confirmed. Scientists like Mason are performing theoretical calculations to determine which solar systems might be better for hosting potentially habitable moons. Violent and active young stars spin rapidly, emitting radiation and stellar winds that could interfere with the habitability of planets and moons nearby. A close binary system of stars can help to dampen these effects, as the two stars synchronize their spins. Binary stars exist in a range of configurations. Some are widely separated, so that a planet in orbit around one functions much like a planet around a single sun, while the companion is so distant that it appears as point-like as any other star. Others may be extremely close together, synching together to keep each other rapidly spinning for billions of years. Mason's research focuses on pairs of stars that orbit each other between 10 and 60 Earth-days, with a planet in orbit around both suns. These are known as circumbinary systems. The paired stars exert tidal forces on one another that cause a slowdown in spin, weakening the radiation and stellar wind of the pair faster than they would suffer as single stars. Fast-moving stellar winds can strip a moon or planet of its atmosphere, leaving it open to heavy radiation bombardment that can interfere with the development of life. "The habitable zone in a binary system is a little bit farther away, simply because you have the light from two stars rather than the light from one," Mason said. This distance is important because, if a planet orbits too close to its parent star, its moon can be stripped away completely. "The closer a planet is to the star, the smaller its gravitational sphere of influence," said David Kipping and astronomer at the Harvard-Smithsonian Center for Astrophysics in an interview with Astrobiology Magazine. "Essentially, the star will rip off the moon if it gets too close," he said. Kipping, who was not involved in the research, searches for exomoons and is the principle investigator of The Hunt for Exomoons with Kepler project. Pushing exomoons farther away also has ramifications for red dwarfs, the most populous stellar type in the galaxy. The habitable zone around these smaller, long-lived stars is so close to its parent star that stellar activity made many astronomers consider habitable planets around them unlikely to even exist, though recent researchhas increased the potential. 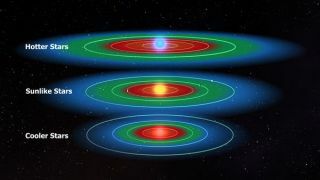 In a binary system, the pushed-back habitable zone would decrease many of the negative effects that limit habitability around the plentiful stars. According to Mason, if the sun had a companion star, the makeup of the solar system would change significantly. The water stripped from the atmosphere of Venus would likely still be present, making it potentially habitable. Earth itself could have been a very different environment. "Earth would be a wetter planet if we were orbiting a binary star," Mason said. Astronomers recently found evidence of plumes of vapor coming off of Jupiter's moon Europa. Europa is thought to house an ocean under an icy surface, making it one of the best potential sources for life in the solar system. When it comes to potentially habitable exomoons, sun-like stars are always better. "The ideal circumstance is solar twins," Mason said. Simply adding a sun-like star to the mix improves the chances for life. "Solar-type stars with companions work really well," Mason said. "They work better than our own solar-type star without a companion." Still, if at least one of the two stars in a binary system is sun-like, it provides a very wide habitable zone with plenty of room for water, a situation that Mason says he's most excited about. A wider habitable zone means a better chance of hosting planets capable of sustaining life, as well as exomoons that could support it. "There's plenty of room for several habitable planets," Mason said. "These may be places where many worlds in system could be habitable." Unfortunately, systems with multiple planets make finding exomoons more challenging at the moment. Saturn's moon Titan boasts lakes of ethane and methane, the only body in the solar system other than Earth known to hold liquid water on its surface. Extrasolar moons like Titan could exist in the increased habitable zone of close binary star systems. Astronomers hunt for distant moons essentially the same ways that they hunt for distant planets. They might watch for the planet and its moon to cross between their sun and the Earth. As a single planet crosses, it causes a dip in brightness; if a moon precedes or follows it, that dip is preceded or followed by a smaller dip as just the moon blocks the stellar light. They can also watch a planet for a small wobble as the moon gravitationally tugs its host ever-so-slightly. A moon might also slightly change how quickly a planet orbits its sun. In a multi-planet system, however, other planets can also cause the wobbles and velocity changes, making them "kind of a pain for looking for exomoons," according to Kipping. Kipping and his team have pared down the list of almost 5,000 planetary candidates detected by NASA's Kepler spacecraft to approximately 250 bodies considered the best targets for hosting an exomoon. Originally, he hoped to target Jupiter-size and larger planets. In the solar system, the only moons considered potentially habitable orbit gas giants. Earth-sized moons could lay outside of the habitable zone of a star but still hold liquid water due to tidal heating from their planet. Such moons would be minimally affected by their orbit around a binary star system instead of a single star. "One of the most staggering discoveries from Kepler is that Jupiter-like planets are rare," Kipping said. "This is kind of a shame for the exomoon hunt, because those are the planets easiest to find a moon around." Instead, Kipping and his team have turned to the slightly less massive sub-Neptunes, which abound in Kepler's field of view. Although moons around Earth-sized planets may not be habitable by themselves, they could have an enormous impact on their parent body. Born of a collision early in the life of the solar system, Earth's moon is far larger by comparison to its planet than other moons in the solar system. The collision might have kicked off volcanism and plate tectonics on the early Earth, while the moon stabilizes the planet's tilt and controls the tides. Biologists consider all four actions important to the evolution of life. "There are many beneficial qualities to having a big moon nearby," Kipping said. "If we find Earth 2.0, one of the first things we'll be asking is if it has a Moon 2.0." Because our moon is unique in the solar system, scientists don't yet understand whether its formation was what Kipping called "a freak event" or something that's very common. Detecting different kinds of moons in a variety of orbits will help scientists narrow down how unique the solar system and the Earth-moon system are. An artist's image of Kepler-35, where a Saturn-size planet orbits a pair of sun-like stars. Such systems could host an exomoon within the habitable zone of the stars. As scientists have used Kepler to hunt for exoplanets, they have learned a great deal about the variety of planetary systems in the galaxy. According to Kipping, circumbinary systems were once thought to be "the more exotic type" of binary systems. But Kepler revealed several cases, showing them to be fairly common. Though the mission goal is to detect planets, Kepler is an important tool when it comes to looking for moons outside of the solar system. "Kepler is really the ideal instrument for detecting exomoons," Kipping said. He pointed out that while NASA's upcoming James Webb Space Telescope, to be launched in October 2018, will be ideal for follow-up observations, it will be in too high of a demand by the astronomical community to stare at a patch of sky for years on end the way Kepler did. If Kepler's second run, K2, is funded, it will stare at a different region of the sky than the original Kepler mission, and will provide greater insight into planet populations. Though he expressed excitement about the exoplanet discoveries that will come from both upcoming missions, he said, "My feeling is that Kepler is still probably the best resource for discovering exomoons." As to how long it might be before the first exomoon is confirmed around a distant planet, Kipping said that it depends on how common larger moons are. "If Nature builds big moons—Earth-sized moons—very frequently throughout the cosmos, then they're in the Kepler data," he said. "They're lurking there, and we will find them in the next year or two." If, however, most of the moons are small, like the ones in orbit around Neptune and Uranus, they may never be seen. If moons large enough to be detected exist, Mason is confident that the most habitable of them can be found in circumbinary systems. "Exomoons in binary systems may be more habitable than around single stars," he said in his presentation at the AAS meeting. "Maybe less common, but potentially more habitable." This story was provided by Astrobiology Magazine, a web-based publication sponsored by the NASA astrobiology program. Follow us @Spacedotcom, Facebook or Google+. Published on Space.com.